While caching today with my family on International Geoaching Day, I stumbled across a real gem of a cache. To avoid too much spoilers (the pics in this post are no more spoilers than what are in the cache listing) I'll skip telling you the location, or the name of the cache, however I will tell you it is in the middle of a city. The cache is in a cabinet in the middle of a really awesome courtyard between a couple rows of century old townhouses. The cabinet houses a little library where anyone can take or leave a book. Completely on the honour system. 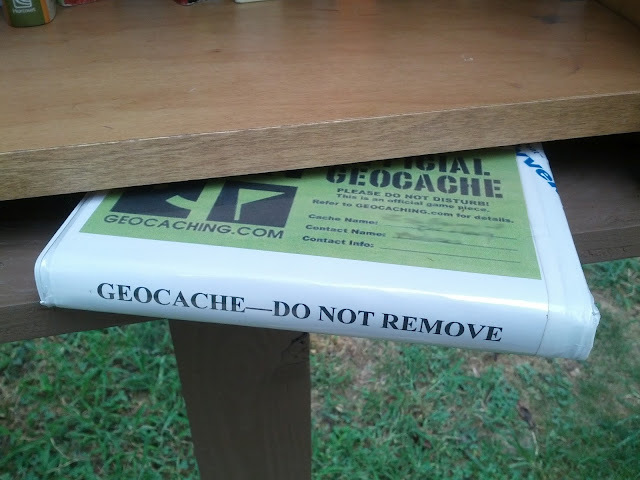 The cache itself? Exactly what you'd expect. Guess. Magnetic key holder? pill bottle? Ammo can, LOL? No. No. No. It is, of course, a book. Specifically an old VHS case (remember those things?) done up to resemble a book. This is probably the coolest little urban cache I've come across. In fact I liked it so much when I got back to the van (I had ventured solo on this one, leaving my wife with the reading/sleeping kids in the van), I insisted my wife go and see it for herself. This is a reminder to all of us who hide geocaches that we can do better than bison tubes in trees, or key holders in guardrails. We can, given enough effort, put out awesomeness. What a great cache, and a very pretty area by the looks of it. Yes this does make a great change from the norm. And lovely that there are honest folk about to have an honesty library like that. I have one of these! GC41161!